There are a number of burial mounds, standing stones, and earthen enclosures remaining on the site, testifying to its importance in ancient times. The cemetery is not infrequently referred to in ancient Irish literature under the name, Brugh na Bóinne, "Palace of the Boyne." Its royal character is emphasized, and it is traditionally associated with a mysterious personage called variously Oengus an Brogha, "Oengus of the Palace," Oengus mac ind Ócc, "Oengus, son of the two youths [?]" or Oengus mac in Dagda, "Oengus, son of the good god"; there can be little doubt that he was an ancient divinity. There is every reason to believe that the cemetery was associated with the early history of the royal establishment at Tara, about twelve miles away. Among the remains of this ancient cemetery, three mounds stand out conspicuous by their size and importance. They are known in modern speech as Dowth, Knowth, and New Grange, the first two being corruptions of their ancient Irish names, the latter an entirely modern English name. Of these three the most prominent is New Grange, which is, indeed, one of the most important prehistoric monuments in the world. The modern aspect of New Grange, as the visitor approaches it from the road, is far less impressive than it was in the time when it was a centre of religious cult. It now presents the appearance of an irregular mound, overgrown with trees which obscure its outline and which have seriously injured its integrity. Its height is 44 feet, but to judge from the accumulation of debris at the bottom, fallen from the top and sides it must have been originally about ten feet higher. There is reason to believe that, when new, it was a shapely hemispherical mound of stones, the entire surface of which was covered with a layer of broken fragments of quartz. These must have been conveyed from a considerable distance; and the effect which they produced, as they sparkled in bright sunshine, must have been very striking. The mound would by this means be rendered conspicuously visible from a long distance. 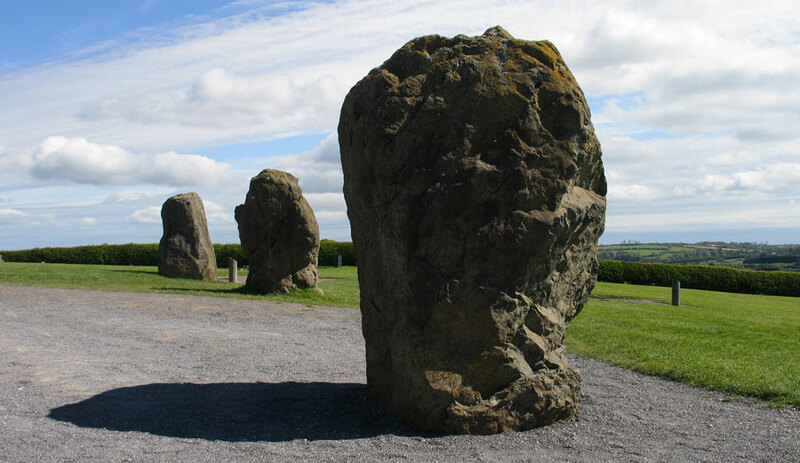 The visitor's attention should be called to the following features of the structure: the surrounding stone circle; the kerb; the entrance passage; and the burial chamber. Sixteen Roman coins were found at Newgrange. Thre stones from the Great Circle at Newgrange. These massive rocks are 2.5 meters high and weigh several tons. The circle was erected some time after the mound of Newgrange was finished. (Plan, Fig 1.) — This seems to have consisted, originally of about 35 stones assuming that they were set at approximately the same distances from one another around the entire mound. Fig 1: Plan of Newgrange. Only twelve however, remain, of which those in front of the entrance are most conspicuous—the tallest is about eight feet above ground. This ring of stones is most probably the boundary of the sacred enclosure, within which no one not compelled by duties connected with the burial or with the due performance of burial rites, could venture to enter. We may reasonably assume that it was also a boundary for the dreaded spirits of the dead, so that they should not transgress it and molest the living. The top section of Kerbstone 52. Inside the circle, but not quite concentric with it, is the mound itself, covering an approximately circular area about 280 feet in diameter, or about an acre in extent. It consists entirely of loose stones of very different sizes; earth is now intermingled with them, as a result of the gradual conquest of the surface by the vegetable growths from which it was originally free. These stones are now kept from rolling down the hill by a modern retaining wall, which, though it serves this useful purpose, cannot be said to improve the aspect of the mound. It is rendered necessary by the inadequacy of the ancient kerb, which was intended to serve this purpose, but which has been greatly distorted by the pressure of the immense weight of stones behind it. The retaining wall is for the greater part of its length founded upon this kerb. This consists of a series of great slabs, about a hundred in number, measuring about four feet in breadth and six to ten feet in length, and placed standing upright upon one of their longer edges. They touch each other edge to edge, and form an unbroken ring around the structure. In this kerb we meet for the first time with the remarkable sculptured ornamentation which is one of the most striking features of the monument, and upon which some remarks will be made later. Especially to be noticed is the stone immediately in front of the entrance (see cover), with an elaborate diaper of spirals upon it—the most richly carved of all the ornamental stones; and two other stones (see Fig. II), not, apparently, in any way connected with structural features of the mound, on the sides opposite, the entrance. About half the stones in the kerb bear ornamentation, but with the exclusion of these three, the decoration is slight—a single spiral, a single zigzag, or the like, roughly pocked on the surface. The entrance passage is a straight gallery, 62 feet long, and of varying height (see Fig. IV). Visitors should carefully guard their heads in passage through it, as some of the roofing stones, or the modern concrete struts which are necessary for the maintenance of the structure, might easily inflict a very severe blow on the unwary. It is constructed of large flat roofing stones—one of them about fifteen feet in length—supported on the stones of the structure, which are retained in position by lining-stones on each side of the passage-way. Some, but not all, of the lining-stones also serve as props for the roofing-slabs. A number of the lining-stones bear ornaments; the visitor should specially notice one on the left-hand side (as he enters), a little more than half-way down the passage (see Fig. III (a)), with an elaborate pattern of spirals and zigzags, and another a little further on, on the opposite side, which has concentric circles —the only stone in the monument on which this device is used. Plan of the Chamber at Newgrange. The Burial Chamber, with its side recesses and with the entrance passage, makes a construction of the shape of an irregular Latin cross on plan. It measures from the end of the entrance passage to the back of the opposite recess, 18 feet; from side to side, through the side recesses, 21 feet; and in maximum height, 19 feet 6 inches. The entrance to the Chamber is in the south-eastern side of the hill, and the long axis of the passage and chamber runs north-west and south-east. The burial chamber consists of a roughly circular area with three side recesses of varying depth. As New Grange was rifled by Scandinavian pirates in the year 861 A.D., we are unable to say anything about the actual disposition of the ancient interments within it; but analogy with similar structures which have been excavated in recent years shows that these recesses were the receptacles for the interments themselves. These were probably cremated and deposited either in urns or upon small slabs of stone, and heaped up with the associated grave goods upon the flagstones that still remain in the floor of the recesses. The flagstone in the back recess has been broken up, possibly by raiders in search of treasure or of an entrance to supposed concealed passages further in. The right-hand recess, as the visitor enters (see Plate, above), was evidently the most important. 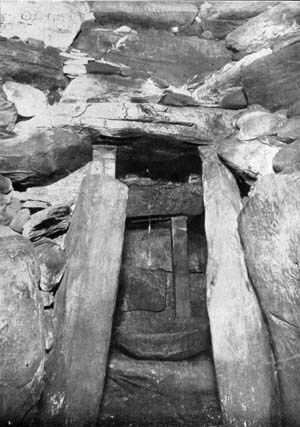 A large stone sarcophagus stands upon the floor-slab, and the stones with which the recess is constructed are of impressive size and are richly decorated. The roofing slab of this recess is the most elaborately carved stone in the entire series (see Fig. III (b)). Right-hand Recess. The roof (spirals, zigzag and elaborate composite patterns). Right-hand walling stone (row of cup marks). Two stones laid horizontally (patterns of zigzags and of lozenges respectively). Back Recess: Right-hand walling stone (ingenious pattern of three linked spirals). The devices used in decorating the stones are lozenges, spirals, zigzags, and similar geometrical figures as well as composite patterns that cannot well be described in words. Similar symbols are found in the neighbouring burial ground of Dowth (except that concentric circles, all but unknown at New Grange, there pre-dominate, while on the other hand spirals are scarcely found at all), and in the similar cemetery on the Lochcrew Hills, near Oldcastle. These figures are doubtless not mere ornament; they conveyed some expression of religious ideas to those initiated into their meaning. But no literary or traditional recollection of the religious ideas of the Bronze Age survives to us, so that it would be futile for us to attempt to attach a specific meaning to them. The great mound of Newgrange viewed from the banks of the river Boyne.